MYSL is a non-profit organization formed to serve the Muslim youth and the community at large. Based mainly in Mississauga, MYSL provides an Islamic environment for the community to enjoy the sport of soccer throughout the year. The Muslim Youth Soccer League is committed to integrate competitive fun and play within a ‘United Muslim Environment’ for all members of the league. 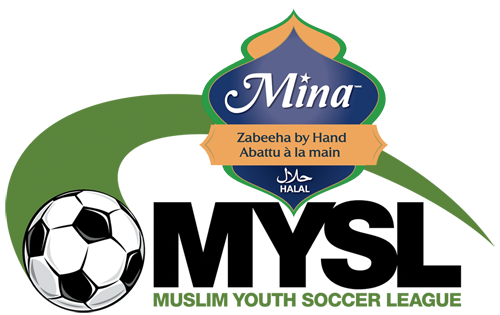 It is MYSL’s mandate to ensure that all players will benefit from the game, not only from a health’s perspective but also from interacting playfully with Muslim boys and girls of all different cultures, on a regular basis. As members of a rapidly growing Muslim community, it is our duty to teach our children to play together today, regardless of their cultural and/or racial differences, so they can work together in unison tomorrow. * To encourage the development of team sport in the Muslim community. * To provide impartial, non-biased opportunity for all players, boys and girls, to play freely regardless of their race or ethnic backgrounds. The Muslim Youth Soccer League was founded by the grace of Allah (SWT) in December of 2001, as an official ‘affiliation’ was put in place with the Muslim Soccer League, already in existence since 1989. Our first season – summer 2002 - was Allhamdullilah a great success as we managed to register 65 players – boys only - and with the support of many MSL members as well as our dedicated coaching staff, we took our brand new league all the way to a Season’s Playoff in Mid-September. Our second season was another great success Allhamdullillah; the‘turn out’ exceeded, by far, our initial expectations in terms of registrations. The growing pain’s analogy would be exactly that of a 12-year-old child turning 20 over night. Thus, our team of managers and field staff have been working relentlessly to bring your Muslim Youth Soccer League to a higher level of professionalism and establish a sound system, which will work for years to come, Insha’Allah.